The paper characterizes S. Oldenburg’s contribution to the studies of Nepalese manuscripts and demonstrates that Oldenburg was a brilliant expert in this research area. His minor texts on the relevant matters can be used as important sources for the reconstruction of the ways the St Petersburg Asiatic Museum acquired Indian manuscripts during the 1870s and the forms of bilateral relations between the Russian and foreign Buddhologists concerning studies of Sanskrit manuscripts found in Nepal. The author of the paper attributes and dates Buddhist bronze sculptures which belonged to Academician F.I. Stcherbatsky and are kept now at the State Hermitage Museum. In the archives of the State Hermitage we managed to find materials related to the history of the Buddhist temple in St. Petersburg during the early years after the Russian Revolution of 1917. These papers, in our opinion, are of considerable interest and allow for a fresh look at the history of the Buddhist temple in St. Petersburg. Therefore, we introduce these documents arranged in chorological order and supplied with some information about the activity of the State Museum Storages, an organ formed to take care of numerous cultural valuables nationalized after the Revolution. The paper deals with A.M. Pozdneev’s archival documents in Russian, Tibetan and Mongolian languages kept at the Archives of the Orientalists of the Institute of Oriental Manuscripts, the Russian Academy of Sciences. It introduces some of his working notebooks, abstracts, reviews, translations, and texts collected by him, through brief description of their outer features and contents. These sources demonstrate Pozdneev’s broad academic interests and show the principles used by him for the study of Tibetan texts. As a result of his conquests, Gushi Khan of the Hoshut Mongols succeeded in the creation of a vast state which included Kokonor (Qinghai), Central Tibet and Eastern Tibet. The territory of this Hoshut Khanate roughly corresponded to the territory of the Tibetan Empire of the seventh-ninth centuries. By the power of his military forces, Gushi Khan made the Gelugpa School the dominant Buddhist school in Tibet. Gushi Khan’s subjugation of Tibet and surrounding areas had the approval of the Manchu Qing dynasty, and this fact is demonstrated by the visit of the Fifth Dalai Lama to Beijing. The Hoshut Khanate had originally been independent from the Qing Empire but was later absorbed by it, and finally ceased to exist in 1724. The first quarter of the 18th century was a unique period in the history of Tibet since there existed three Sixth Dalai Lamas such as Tsangyang Gyatso brought up by the regent Sanggye Gyatso, Ngawang Yeshe Gyatso, the Mongolian Lajang Khan’s political puppet, and the Seventh Dalai Lama Kelsang Gyatso who was recognized as the Sixth Dalai Lama by the Qing court. This paper is based on Chinese sources written by the contemporaries of the events and represents the evolution of the Qing court’s attitude to the issue of recognition of the Sixth Dalai Lama and Seventh Dalai Lama. Keywords: Tibet, Dalai Lama, Qing, Kangxi, Yongzheng, Kelzang Gyatso, Tsangyang Gyatso. Samten Gyatso Mijig Yangchen Gawe Lodrö (1914-1993) is widely known in Tibet as Muge (Murge) Samten Gyatso (Dmu dge bsam gtan rgya mtsho). This prominent Buddhist scholar and enlightener made an important contribution to development of Tibetan culture during the previous century. The present paper based on the scholar's autobiography Rang gsal Adarsha presents a brief account of the formative stages of his path as a scholar, expert in the ten Buddhist cultural sciences, a spiritual teacher and a great enlightener of his time. The numerous commentaries and original works by Muge Samten Gyatso summarizing his great knowledge of the ancient and mediaeval Tibetan texts cast light on the problems of philosophy, history, and culture of Buddhist Tibet. The study of his autobiography and sumbum does not leave place to doubts that Muge Samten Gyatso is one of the greatest Tibetan scholars active in the 20th century. This paper deals with some aspects of the process of Tibetan ethnic identity preservation under the circumstances when the usual adjustment mechanisms do not work or work but partially. It is based on the study of examples given by the Tibetan migrants in North India (Himachal Pradesh) and, to a lesser degree, the Tibetans who migrated to Western countries. Basic components of ethnic identity include education, religion, language, traditions and customs, literary tradition, etc. Their proper preservation and maintenance can help prevent Tibetan migrants from losing their ethnic identity and reach a new stage in the development of Tibetan society in the Diaspora. The paper presents some tentative results of analysis of the structure of the famous collection of Buddhist texts that became known as Gzungs ’dus in the history of Tibetan and Mongolian literatures, and brief characteristics of major literary genres found in the collection such as sūtras, dhāraṇī-sūtras, mantras, hymns and prayers. The issue of the initial list of texts of the collection compiled by Tāranātha in the first third of the 17th century is touched upon, too. The Great Treatise on the Stages of the Path to Enlightenment (Lam rim chen mo) written by Tsong kha pa, founder of the Gelug school, gave rise to a great number of commentaries and reference works in Tibetan and Mongolian world. The vocabulary of The Great Treatise abounds with special terminology and includes a lot of quotations from Tibetan masters containing dialectisms which could not be understandable far and wide. 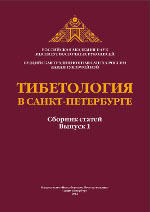 Therefore a number of terminological works on The Great Treatise were created, the Tibeto-Mongolian bilingual explanatory dictionary described in this paper being one of them. Its compiler used a number of Tibetan lexicographical works on the subject but it contains also some Mongolian materials, hence this dictionary is useful as a source on the Mongolian translations of The Great Treatise and its functioning in Mongolian world, these issues being comparatively under-investigated. The paper attempts to classify Tibetan grammatical structures with particle la and its synonyms according to the semantic type of verbs forming these structures. Moreover, they are compared with the Classical Chinese grammatical patterns with preposition 於 and its synonyms. The paper presents the brief history of the first supplicatory prayer held in St Petersburg’s Buddhist Temple long before the Gunzechoinei Datsan was officially opened. This service dedicated to the 300th anniversary of the Romanov Dynasty was carried out by Khambo Lama D.-D. Itigelov who headed the delegation of the Buddhists from East Siberia. The paper emphasizes an interrelation between the initial stage of the Datsan’s activities and modern approaches to its work. It is maintained also that the Datsan’s development is tightly connected with its religious and educational role within the St Petersburg historical and cultural environment. In the second half of the 19th century, the head of the Buddhist Sangha of Buryatia in Russia, Khambo Lama, wrote a prayer for well-being of the Russian emperors Alexander II and Alexander III and their families, with very little changes, aimed at being recited at the Datsans of Buryatia and the Baikal region. The prayer is found at the Oriental Department of the M. Gorky Library of St Petersburg State University in two versions, namely a manuscript copy, devoted to Alexander II, and block print, devoted to Alexander III. This paper contains the text of the prayer, its translation from Tibetan and a brief commentary on its contents and stylistics. The paper outlines the system of Buddhist education represented in two major educational institutions of the Buddhist Traditional Sangha of Russia (BTSR) such as the Damba Darzha Zayaev BTSR Dashi Choihirlin Buddhist University, located at the Ivolga Datsan, and the Aginsk Buddhist Academy. Peculiarities of Buddhist educational programs and the role of dispute as a form of practical education are touched upon. During the 19th to 20th century, thousands block prints of Buddhist books in Tibetan and, to a lesser degree, Mongolian were made in the Buddhist monasteries, datsans, in East Siberia. These books covered all genres of Buddhist literature and their printing quality was very high. The history of Buddhist book printing in Russia has not been studied well so far, nor there is a full catalogue of monastic editions. The paper briefly characterizes the major stages of formation and cataloguing of the Tibetan collection kept at the Institute of Oriental Manuscripts, Russian Academy of Sciences, from early 18th century up to present. A special attention is paid to the current work aimed at processing and cataloguing of various parts of the collection which should be treated as a great museum collection of books and pictorial artifacts belonging to Buddhist culture. The author of the article considers the basic forms of the iconography of bodhisattva Avalokiteśvara, the god of mercy and compassion, as represented in the art of Buddhism. This bodhisattva is one of the most revered among different peoples and has male, female and wrathful emanations. In particular, according to the Tibetan iconographic texts there are 108 forms of the deity, and the specific forms found in these texts may vary. The article examines the images of Avalokiteśvara fixed in the art of India, Southeast Asia, the Far East and Central Asia.